Asset allocators have had some golden years behind them. Fixed income and equities had negative correlations to each other, so blending them together gave low volatility in client portfolios. Both asset classes had great returns in 2013 and 2014. Now correlations are moving up. The first hint of that was in May-June 2013, with the Fed tapering, and again last April when yields started to rise in Europe. When looking back at the years 2008 and 2011, years when markets were down by more than average, those were years alternative funds had to demonstrate their value added. Looking at 2015, this could be another one of those years. Everything started quite well, but most indices have now given up their yearly gain and gone into negative territory. ...Provided they don't get stuck with the crowd. The risk for crowdedness in markets has gone up a lot. Some of the trades that look obvious for people to take positions in become very quickly crowded, and crowded positions are actually the worst to be in, in highly volatile times, because they get unwound the fastest. So typically in areas where most of the market focuses on at such a point of time, you can also suffer the biggest pullbacks. This can be a very dangerous dynamic: things that are in the news attract so much attention, and so much positioning and very quick trading, and this can make the market more treacherous. Read on to learn how Gerlof de Vrij from Blenheim Capital tries to identify a crowded trade. Can risk management make markets riskier? Everything with a high yield, high carry, high roll-down, and low volatility, can turn out to be a minefield for investors, despite the “low” risk. The Swiss Franc and then the Chinese yuan were examples where people assume they can count on a presumed base or risk level, but then that suddenly breaks. And because those people had scaled their positions on short-term, historic volatility measures, they often get completely burned. Read on to learn what successful managers do instead. In general, the longer the investment horizon, the better investors can deal with moments when risk increases. But, why has the investment horizon become shorter and shorter for many investors? What factors are behind volatility spikes? Why do investors have less stomach for volatility today? And what are the consequences of that? Are there structural reasons for higher market volatility? Are investors happy with the recent regulatory developments? What is the position of Dutch pensions now towards hedge funds, as in the past they had been leaders in Europe by diversifying into alternative investment funds and hedge funds? 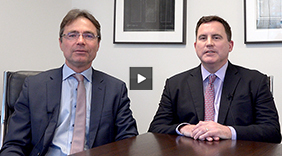 How Dutch wealth advisers use hedge funds and alternative investments.